The Abortion Rights Campaign and our supporters will send 30,000 postcards to our TDs between now and summer reminding them to Legislate for X, because women’s lives matters. 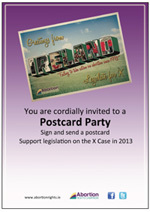 We want all who support legislation on X to send a postcard to EACH of their representatives in the Dail. How can I get postcards? Download our printable postcard pack, print out your postcards and post them directly. Or drop us an email – [email protected], and we’ll send you 5 postcards and an information sheet. How many people can *you* get to send them? We’ll send you 5 postcards for each. Just let us know in your email. A postcard party is a simple way to gather together with like-minded people and discuss the merits of sending a postcard in a relaxed environment. Abortion Rights Campaign have coordinated a 10 day programme of events and activities in collaboration with supporting groups around the country. From 1st-10th March 2013, we invite the electorate to let your TD know that you represent the majority that support this legislation; 10 friends – 10 days is all that’s needed to make a difference. Get our Postcard Party Pack which has all the information you need to get your postcard party set up. I’m part of a group who supports this campaign, how can my group help? Have a table / stall at an event: do you have a public event between now and summer? The Abortion Rights Campaign can give you a box of postcards and explanatory flyers and you can have a ‘postcards’ table at your event. All members need to do is sign their name and home address on 5 postcards and we can take care of the rest. If you need people to run these stalls, the Abortion Rights Campaign will be happy to help. Please drop an email to [email protected] to let us know about your event. We will happily publicise it to our members too. Notify your members of the campaign so they can request postcards themselves: Let your members / supporters know that this campaign is happening, and they can email [email protected] to request postcards that we can send out. 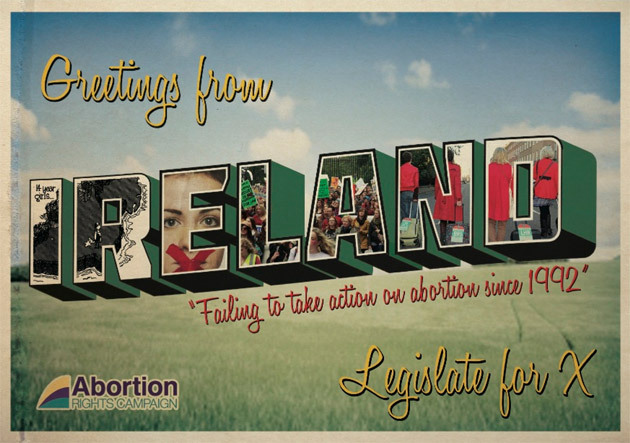 Send postcards to your members: the Abortion Rights Campaign can give you a box of postcards and explanatory flyers and you can send 5 postcards and a flyer to each of your members. Your members can find their representatives by entering their home address in www.whoismytd.com . We appreciate there is a cost incurred for organisations here but appreciate any financial support available. Please drop an email to [email protected] to request postcards and information sheets. Caught a glimpse of the postcards, they look absolutely fantastic. Well done to the designers. Can’t wait to get mine and post them. Absolute legend you are, Legends!!! Postcards look wonderful! Printing some out right now! Well done!